Is the market topping or is this just another in a string of smaller “repeat top” patterns for the S&P 500? Let’s take a look at a recently repeating pattern and chart the levels to watch if history does indeed repeat. One could also add Negative Breadth and Volume Divergences along with the 3/10 Momentum Oscillator. In each even from July 2013 to January 2014, price retraced in a sell-swing down against the new “retest” high. Friday saw an incremental new “all time” high for the S&P 500 ahead of an intraday reversal that carried forth with additional selling today (Monday, March 24). After each yellow highlighted “Failure Test” pattern, I also included the red highlighted “sell swing” or retracement against the uptrend. 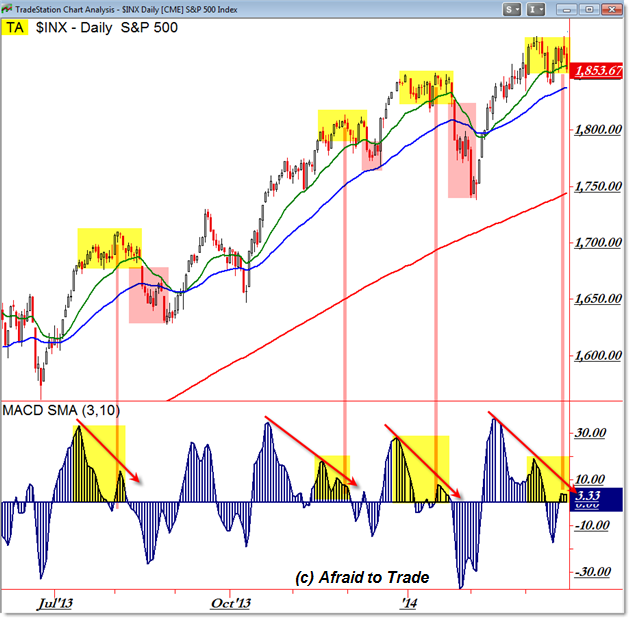 With the exception of January 2014, price completed a shallow but stable retracement down toward – or just under – the rising 50 day EMA. For now, we’ll continue to focus our attention on the 1,875/1,880 pivot high and potential for yet another possible repeat outcome from the “Weak New High” or Failure Test pattern that developed three times recently on the Daily Chart.